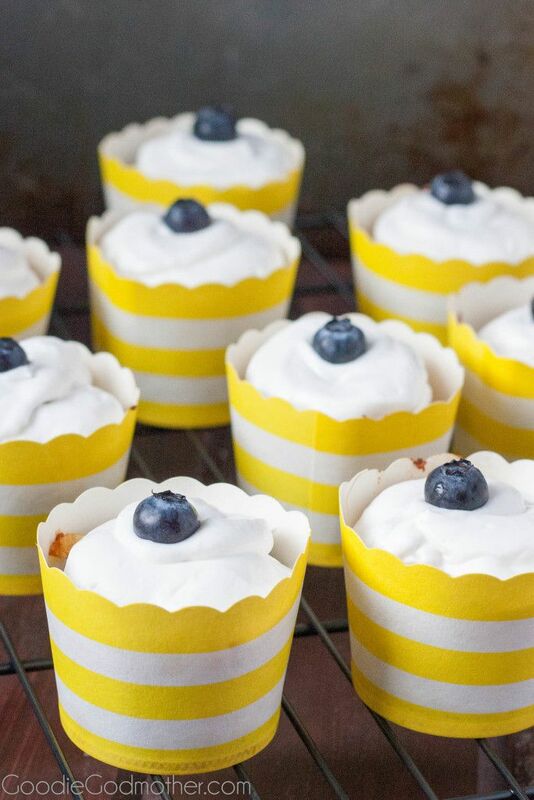 Fresh lemon flavor studded with fresh organic blueberries, held together by a nut free, dairy free, gluten free, refined sugar free batter, and topped with whipped coconut cream frosting, AND, it’s husband and toddler approved. Sounds like a tall order, doesn’t it? 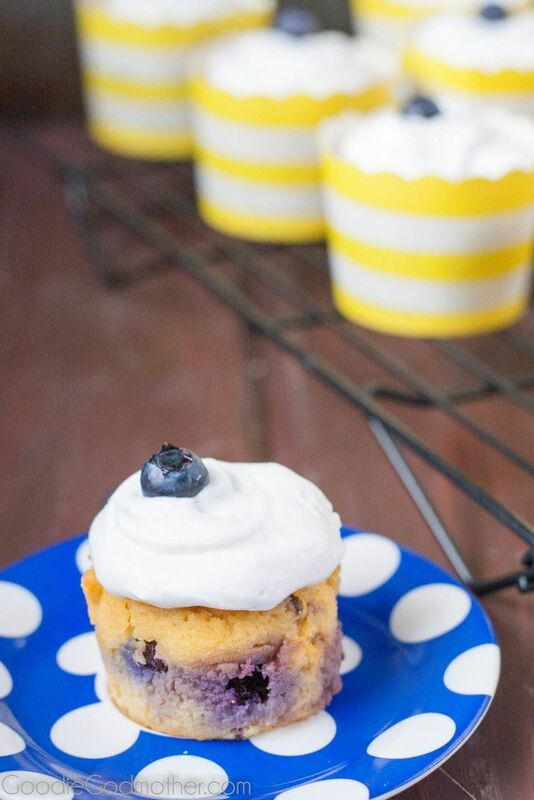 These paleo lemon blueberry cupcakes were a challenge I presented to myself after a friend told me about a coconut flour only cinnamon roll she tried at a conference. I tried that.. it was a disaster, so it’s on my drawing board for later. The thing is, coconut flour is very drying, and so normally one wouldn’t use it as the only flour in a baked good, but if you hang around here long enough, you’ll realize I really like to try and make the improbable happen for fun. Since I have a pretty good handle on making gluten free/paleo cupcakes, I decided to create one with just coconut flour to build confidence. My biggest challenge is that I use nuts in the majority of my paleo baking and the results are spectacular! Just ask the people on my e-mail list who have my free Easy Weekday Breakfast recipe booklet and the exclusive-to-the-book Paleo Maple Bacon Muffin recipe. Those are amazing, and this is a shameless plug for my e-mail list. 😉 So it’s with a bit of hesitance that I stepped away from my happy comfort zone and started working on these coconut flour cupcakes. It took a few trials, probably since I started winging it at the beginning, and some were fantastic disasters. So I turned to Google, and found a vanilla cupcake recipe by Comfy Belly, which I adapted with much better results! And that resulted in this recipe, which was finally approved by the Godfather and Princess A. It’s not a traditional cupcake texture, but it is good, and you really don’t taste a ton of coconut in the batter. You do get a stronger coconut flavor because of the frosting I used, so if you’d prefer to avoid that and have no dairy sensitivities, a whipped cream frosting would be my suggestion. I think they looked just darling in their happy yellow cupcake wrappers, and I hope you enjoy this “healthier” cupcake treat! Preheat your oven to 350 F and line a cupcake pan with liners. 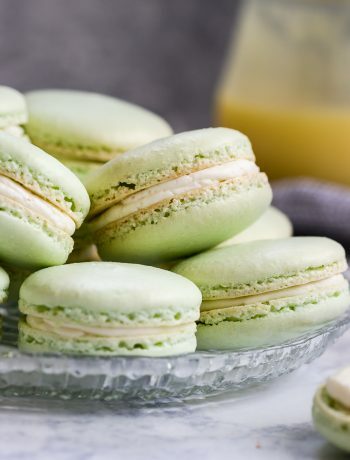 In a mixing bowl or the bowl of a stand mixer fitted with the paddle attachment, combine the dry cupcake ingredients (coconut flour, baking soda, baking powder, salt, lemon zest). In another bowl, combine the eggs, oil or ghee, maple syrup, and lemon juice. Stir the wet ingredients into the dry. It will look kind of crumbly, don't panic. Gently stir in the fresh blueberries. 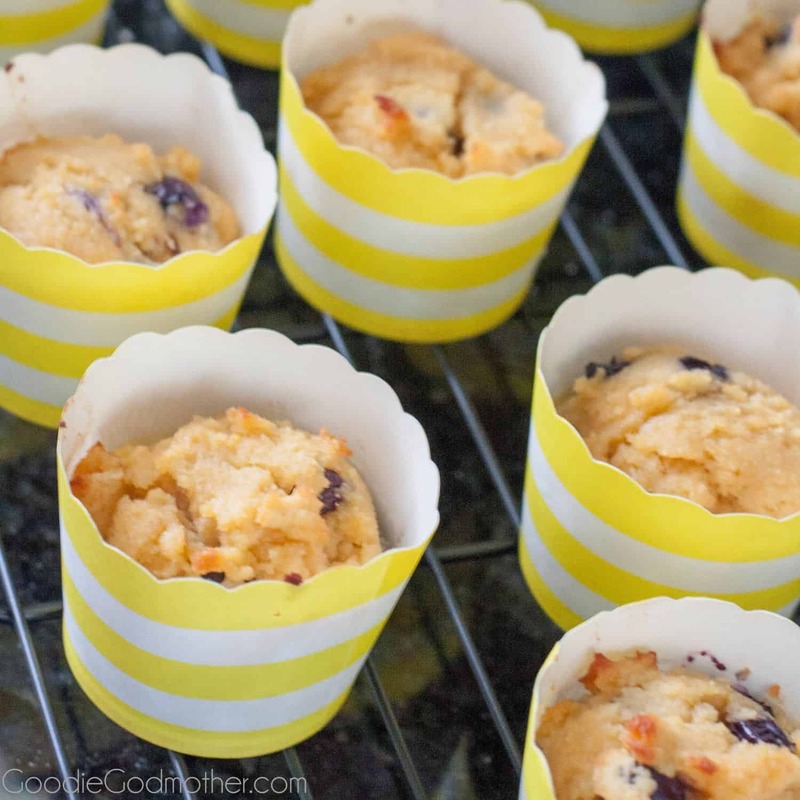 Scoop the batter into the cupcake liners, filling them about ⅔ of the way. I used an ice cream scoop to make it easy. Bake for 20-24 minutes until a toothpick comes out clean. Remove from the oven and allow to cool completely before frosting. Remove the chilled can of cream of coconut from the refrigerator. Do not shake! 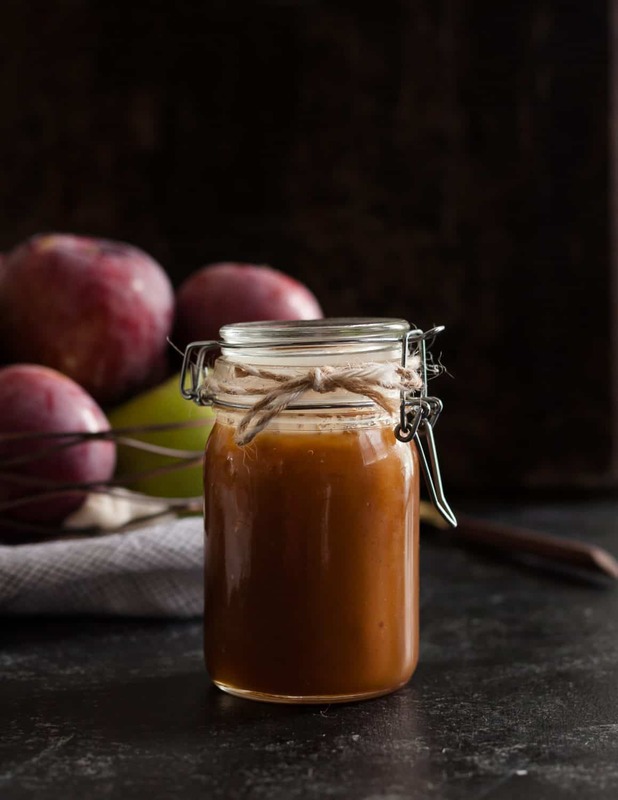 Open the can and pour off the liquid or reserve for another use, and place just the firm coconut into a mixing bowl or the bowl of a stand mixer fitted with the whisk attachment. Since coconut cream doesn't whip up the same as whipped cream, you'll need to add the coconut or palm oil to help provide structure. Whip 2-3 minutes on medium high until well combined. Add the lemon zest, lemon juice, and honey. Whip again to combine. 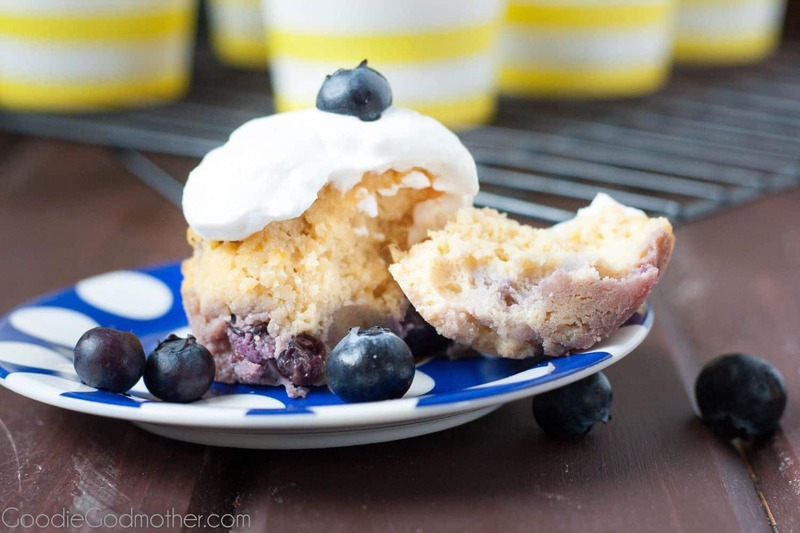 Frost the cooled cupcakes and top with fresh blueberries! Emergency passed. Thank the good Lord I did not add more flour of any kind! While I came to use my computer and look for comments from others that experienced something similar, my coconut flour did the work and it became more batter like. The cupcakes are baked and out of the oven and smell amazing! I’ll be a real hit at Altar Guild tomorrow! I’m so glad I was able to reach you via e-mail and the cupcakes turned out beautifully! I hope they were enjoyed! These remind me of my blueberry muffins , how adorable. But I’m really stuck on those yellow striped paper cups, i’m in love ! 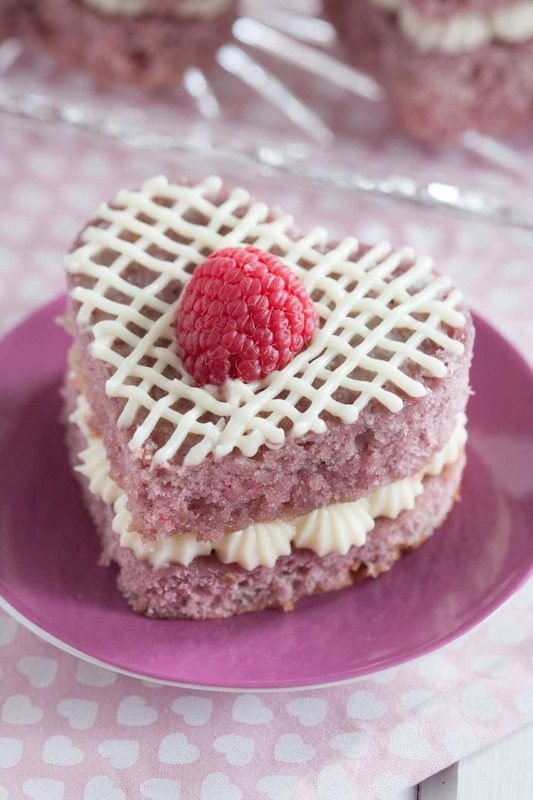 I am making these cupcakes now and religiously following the recipe. They are VERY liquidy! I’m not sure what to do! There’s nothing crumbly about this batter! Help!!! Oh YUM! These look amazing! I have a good friend who is paleo so I am going to give these a try the next time she comes over.